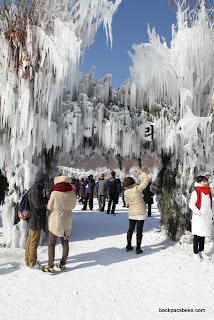 These are pictures from Mrs. B’s trip to the Inje Ice Festival this weekend. Hope you enjoy! The temps were quite chilly! Oh and no, she wasn’t brave enough to eat the live smelt fish….she just draws the line at bugs :). Hope you are all warm and toasty wherever you are located. 10/01/2011 (Yes, we are a bit behind on uploading/ blogging) SORRYYYYY!!! Tonight we made plans to grab a bite to eat at a restaurant very close to our apartment. The restaurant we decided to try out is called Shin-Hung. We finally had some free time to meet up with our good friend Mary G! We have to mention on our blog that Mary’s husband is incredibly sweet! Robert stayed at home (on his birthday, mind you) with their twins so that she could have some “adult-time”. Thanks again Robert!! Okay, back to dinner…Shin-Hung is a restaurant located at the base of the Soyo Mountain in Dongducheon. Shin-hung is pretty popular and known for various dishes among the Koreans, so we are told. The restaurant is fairly large in size, the staff are nice, but do not speak any english. If that is a cause for concern to anyone, don’t let it be… you can simply point at the menu and they will know what you are after. 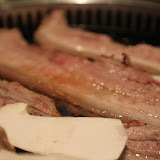 After looking at the menu we went with Samgyeopsal (Pork-belly). After dinner we all decided that we would come back sometime and try the mushroom stew. We got to see the mushroom stew at the table across from ours and it looked delish! After a nice dinner with great company we continued our night by walking up the road just a bit to get to the Rock Festival. We were pretty impressed! The festival was FREE! There was a HUGE professional stage with lights and camera coverage! Plus, the music wasn’t half bad and we could people watch! Score! Have we told you lately just how much we love Korea?! Most of our family and close friends have already seen the video and now we want to share it with the rest of our blog friends. Mrs. B is still working her way through video editing. This is her first attempt (please be kind) but feel free to let us know what you think! 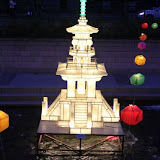 The video is from our experience attending the 2011 Lotus Lantern Festival held annually in Seoul. We hope that you enjoy! If you haven’t already done so, please feel free to check out the pictures from the festival back in a previous blog posting. This weekend marks the two-thousand-255th anniversary of Buddha’s birth. Located on the main street in front of the Jogyesa Temple, we checked out the Buddhist street festival. This festival featured over 100 booths set up to demonstrate ceremonial tea-making and ceremonial bowing (a special breathing method used by Buddhist nuns). The best part about this event was that most everything offered was FREE! We were totally taken back at how much stuff there was to do, sample, and see all for FREE! There were also designated translators for foreigners who were at the festival and were struggling to understand or communicate what was was going on. We made lotus flowers, sampled traditional teas, tried various temple foods, got to try on traditional Korean hanbok clothing and have our picture taken, had our face painted with a lotus flower, went inside the beautiful Jogyesa temple, got our last name written in Hangeul the Korean alphabet, and checked out various stage performances. When we were getting ready to leave we came across the Tibetan monks making a sand mandala. This sand mandala contained various colors of sand that are made from crushed gypsum (white), yellow ochre, red sandstone, charcoal, and a mixture of charcoal and gypsum (blue). Don’t worry we snapped pictures to show you what we are talking about. 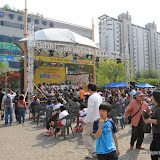 We had an AMAZING time at the Friendship Festival at the Seoul Plaza, Mugyo-dong! The festival is just a small piece of the action going on in this bustling city in the beginning of May. We found out in doing a bit of research that the festivals going on this week are 9 days and are spread out over 8 different surrounding areas. We think it is awesome that the city does this yearly and we would have loved to have experienced every part of the festival but unfortunately we were only there for the weekend with an event packed schedule. We lucked out with the weather because it was forecasted to rain the entire weekend we were booked to stay in Seoul. However the weather turned out to be gorgeous the two days we were there! The festival featured booths from 60 different countries all coming together to celebrate global unity and diversity. Each booth had regional crafts, traditional foods, and native performances. We snapped some pictures to share our experience with you all. Onto the foods…the foods were delicious! Most countries wanted you to try a sample of the foods being offered thus enticing you to buy the foods. The foods being served ranged from hot dogs at the United Kingdom stand, pastries from France, joojeh sandwiches from Iran, Mythos beer from Greece, Turkish ice-cream from Turkey, bratwurst and Krombacher from Germany, or Larry’s favorite Norway serving up your choice of smoked or grilled salmon sandwiches. Basically we shopped, took in the sights, and ate ourselves around the world that afternoon. MmmMmmmMmmm!! If you are ever in Seoul during the month of May we highly recommend that you head downtown and see what it is all about. After spending the entire day at the Friendship Festival we decided to check out a café by the name of Artisée and rest out feet until it was time to head up the street where the Lotus Lantern parade would take place. We snapped a few pictures of the Café really enjoyed the green tea latte, coffee, and cappuccino. Once the sun started to go down we decided we better go and find our spots for the Lotus Lantern parade. We heard that you need to stake out prime parade real-estate…we quickly found on that this is no joke! The parade ran from Dongdaemun Gate to the street in front of Jogyesa Temple. At first we were smushed in a large group of people hardly being able to see above some other foreigner’s heads and trying to take pictures and video by holding the camera up over the crowd. Luckily we were able to worm our way up to the front where we were able to see and take pictures of everything. One of the best things we love about Korean’s is their willingness to come up to foreigners and try to explain what is going on at a festival or what something is. We learned that the Buddhist believe the lighting of a lotus-shaped lantern symbolizes the devotion to preform good deeds and that it lights up the dark parts of the world that are filled with such agony. We also learned that the lantern-lighting practice was developed by the Goryeo and Joseon dynasties and is still preserved by public demonstrations such as this parade. This year the city really tried to incorporate bringing foreigners into the mix by offering lantern making events, tasting temple dishes, and making your own rubbings of a Buddhist shape. The parade reminded us of a much grander scale of the Macy’s Thanksgiving Day parade in the United States. The parade featured more than 1000,000 massive, illuminated lanterns in various shapes of lotus flowers, elephants, dragons, fruits, and much more. We were so awe-struck getting a chance to take in these orbs of lighted lanterns bob and sway down the entire Jongno Street. The lanterns are carefully hand crafted with materials such as silk or paper and represent health, longevity, or bountiful harvest. The parade lasted a little over 2 hours and 30 minutes. After the parade the Hoehyang Hanmadang post-parade celebration kicked off. The event was held at the Jonggak Intersection and started roughly at 9:30PM until about 11:00PM. It was crazy because as soon as the parade ended they lifted up the tape holding people back from entering the Lotus lantern parade route and people rushed to grab a seat in front of the two large screen TV’s and stage. We knew there was a post-parade event scheduled but we had no idea that we were in the right location to quick grab a spot up front. The post-parade celebration was just as fantastic as the parade! We got to experience all sorts of traditional and modern Korean dancing and singing. To end the night there was a Korean time-honored traditional circle dance known as a ‘ganggangsullae’ dance, this is where everyone holds hands to dance and sing amongst the flying flower petals (check out the pictures). We loved getting to experience this huge crowd of people all singing and holding hands dancing around in formed circles. 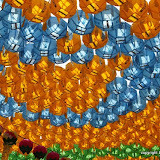 After the dance the burning of written seowon (wishes and resolutions) were released from the lanterns of hope. This is a ceremony in which 100,000 wish lanterns are let loose into the sky. Today is an absolutely beautiful day! The sun is shining and it is going to reach a high of 75! What a great day to get outside and take a walk. Larry and I are really hooked on these mixed nuts from Lotte Mart so I thought I’d go grab some more giving me an excuse to get out and enjoy the sunshine. Before leaving the house I found out today, May 5th, is Korea’s “Children Day”, a holiday that is celebrated to honor children of all ages. How cute is that! I’m not aware of this celebration in the US… but if we do celebrate it, maybe we are just not quite up to speed because we do not have a little bee of our own yet. Anyways, there are various countries that also celebrate this holiday but it may fall on a different day. This special day really reminds me of how the US celebrates Christmas or a birthday because the child is just showered with gifts and fun. In South Korea, Children’s Day is pronounced (orini nal). A Korean children’s writer by the name of Pang Chong-hwan founded the holiday in the year 1923. The holiday represents a child’s need for love, devotion, and respect. Children’s day is also a day to honor adults that have contributed to improving the lives of children. Many cities have events such as parades or activities set up for the children to participate in for the holiday. The celebration that I got to witness located in New City about 10 minutes away from our apartment had all an entire city street blocked off. On this street there was a large stage where children were performing and dancing around, traditional games and crafts were set up and all sorts of vendors selling items geared towards children. In Lotte Mart while picking up our mixed nuts I got to see just how crazy the holiday really was. Toys were set up strategically to market the holiday and of course there were children of all ages picking out a new toy with their parents. It was really entertaining to watch each child so eager and excited to pick out a new toy! I only had my iphone so you have to bear with me on a few of these pictures. I took some quick video with my iphone of the celebration. I thought it was really cute! The kids preforming on stage were really good too! This weekend one backpack bee packed up and headed to the Changwon’s Jinhae Gunhang Je (known as the Cherry Blossom Festival) with friends (Mr. B was under the weather). We took a private bus trip departing in Dongducheon at 6AM to Changwon. Our guide joking stated the best comparison she could provide distance wise is like when you are in the states heading through the four southern states to get to Miami Florida. The trip down was about 5 ½ hours South including three rest/ stretch stops along the way. We enjoyed the bus ride and traffic was fantastic right up until we were nearing the festival location. Our friends packed food for an army so of course we munched on snacks, talked, relaxed to tunes, and munched more. We celebrated Hectors birthday with a cake, candle blowing, and song, along with an anniversary. Changwon’s cherry blossom festival is the oldest known festival beginning in the year 1952 and is held annually April 1st to April 10th. This year marked the 49th year of the festival celebration! 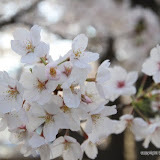 The town is best known as the world’s largest number of flowering beotkkot namu (cherry trees). The festival commemorates Korea’s famous naval hero, Admiral Yi Sun Shin. Closer smaller celebrations near Dongducheon will take place around Seoul later in the month when the blossoms start to open. Last year over 2 million tourists came from all over the world to attend and walk along the beautifully tree-lined streets and take in the picturesque mountain views. At some points when the wind would blow it would look as if it was raining pink petals. Words really cannot express just how beautiful the sights were. I snapped as many pictures to try to capture what the town and festival looked like to share with all of our bloggers. In the pictures you will notice that a new friend Mary and I tried beondaegi, or known as boiled silkworm larve. Yes, ewww! Ha-ha! It was something I said I was going to try and blog about once I had done so. The taste I can’t even put in words. It is definitely something that I have gotten out of my system and do not feel the need to try again….well until I make my way to Taiwan where I hear they are actually pretty tasty. I snapped a few pictures of the various food vendors to include the little beans that one vendor was selling. Suk grabbed the sampling plate and told our group to try them out that they were very good. Surprisingly I really thought they were good! Suke went on to tell us that these beans were a local thing that the area prided themselves on. The beans are said to provide your body with a cancer fighting preventative factor. Next year if we go back I will definitely purchase a box or so because they were so yummy! Okay, enough rambling! Go check out the pictures!